The Wylfa nuclear power plant in Wales was shut down in 2015. Next to it, Hitachi planned to build two new reactors. But the Japanese company has now stopped the project. Two decisions which have been made at the other end of the world have dealt a blow to Britain’s future energy strategy. 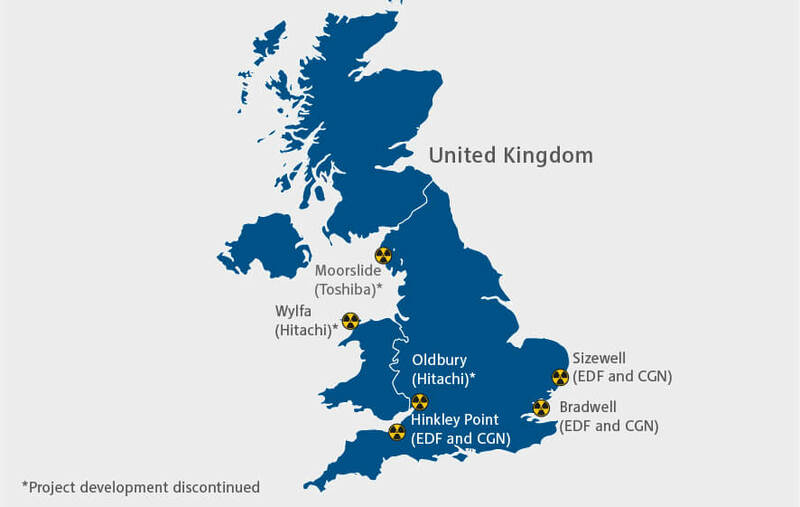 In November, the Japanese electronics group Toshiba announced that its UK subsidiary NuGen, which had planned to build a new nuclear power plant in Moorside, near Sellafield in northern England, was no more. And now, about two months later, the Board of Directors of Hitachi, another Japanese industrial conglomerate, has decided to halt its plans for the construction of the Wylfa Newdd nuclear power station on the Welsh island of Anglesey. Whilst the UK government says it has a range of options for meeting future energy demand, including renewables, storage, interconnectors and new nuclear, this news undoubtedly presents a challenge to its nuclear plans. Seven of the UK’s eight nuclear power plants will be taken out of operation by 2030, meaning that only the Sizewell B power plant in Suffolk will still be online. In addition, the government has pledged to shut down the seven remaining coal-fired power plants by 2025 at the latest. New nuclear reactors formed part of the replacement strategy with the aim of reliably generating electricity, with low emissions. Originally, the government had wanted to build at least six new nuclear power stations with a total capacity of 18 gigawatts (GW), which would have covered around 20 percent of electricity consumption moving forward. 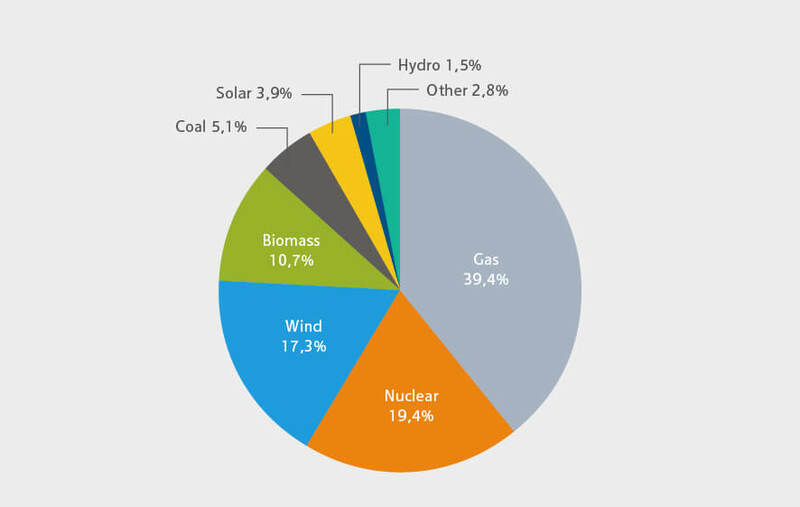 Currently, the share of nuclear in the UK electricity mix is similar – for years now nuclear power plants have consistently been supplying around onefifth of total consumption. But according to the latest announcements, this target appears unrealistic. On Anglesey, the largest island in Wales, Hitachi’s UK subsidiary Horizon Nuclear Power wanted to build two reactors just a stone’s throw from the old Wylfa nuclear power plant, which was shut down four years ago. Construction work had not yet begun, but after years of chasing permits, authorisation to proceed had been secured. However, the construction project has now been halted until further notice. According to media reports, the Japanese group had failed to find private investors for the 21.6 billion pound project. The original forecast costs had doubled. Protracted negotiations with the UK government in relation to price guarantees and financial participation were unsuccessful – despite, according to Secretary of State Greg Clark, the government offering a ‘contract for difference’ of up to £75 per megawatt hour (MWh) as well as considerable support for debt and equity financing. Although Hitachi continues to be open to engaging in talks with the government, the Group has announced that its UK subsidiary Horizon Nuclear Power took a 300bn yen (2.1 billion pounds) write-down and was lowering its profit forecast. This drawback has also affected another planned nuclear power plant in Oldbury in the county of Gloucestershire. Hitachi’s news comes less than three months after Toshiba’s announced exit from the Moorside nuclear project in Cumbria. Together, the three projects (Moorside, Wylfa and Oldbury) would have had an output of more than 9 GW and would have covered around 15 percent of today’s electricity needs. Of the planned new construction projects, only one has made it off the drawing board. The French energy group EDF is building the Hinkley Point C nuclear power station in Somerset with a capacity of 3.2 GW. Construction began in 2017 and the plant is scheduled to go into operation in 2025, but similar projects in Finland and France have run many years over timetable. According to media reports, Hinkley Point C could be completed with a delay of 15 months, in 2027. UK’s first nuclear power station for more than two decades is going to cost more than 20 billion pounds. The two power plant projects Sizewell C in Suffolk and Bradwell B in Essex, which EDF intends to build together with the Chinese energy group General Nuclear Power (CGN), are also still in the process of being planned. Neither project, both of which are currently still awaiting, is likely to go into operation before 2030. CGN holds the majority stake (66.5%) in the development company of the project in Bradwell, with EDF in a supporting role. The Chinese enterprise plans to develop its own reactor design. It would be the first time that a Chinese reactor in Western Europe supply electricity. This involvement in the British nuclear sector has attracted criticism from security analysts and politicians, who are concerned about its links with the Chinese government. They argue, that a Chinese state-owned corporation could gain too much influence over British electricity supplies and could operate dangerous nuclear facilities. Also, there are worries that technology could be stolen, or infrastructure could be left open to cyber-attacks. Media recently reported that CGN is in negotiations with the British engineering company Rolls-Royce which produces instrumentation and control systems for nuclear reactors. The potential cooperation may help to allay concerns about security issues. The construction and operation of nuclear power plants is increasingly considered unprofitable since the price of renewable energy has fallen significantly. For Hinkley Point C, the UK government has agreed a price guarantee of more than 90 pounds per megawatt hour of electricity with EDF plus an inflation premium – for 35 years. This selling price, which is well above the current wholesale electricity price, has been criticised by many experts as being too high. The government was not prepared to make such concessions in the negotiations with Hitachi – the price guarantee was just over 80 euros (75 pounds); too low for the Japanese company that put the project on hold. “We need a new approach to finance new projects,” said Energy Minister Greg Clark. Opposition politicians and business representatives are going further, and according to media reports they are calling for a fundamental revision of the UK’s energy policy.